From left: Tom Fiedler, Donna Green, Margaret Sullivan, Judith Meyer, and Michael Donoghue at the New England First Amendment Coalition’s annual awards luncheon on Friday. 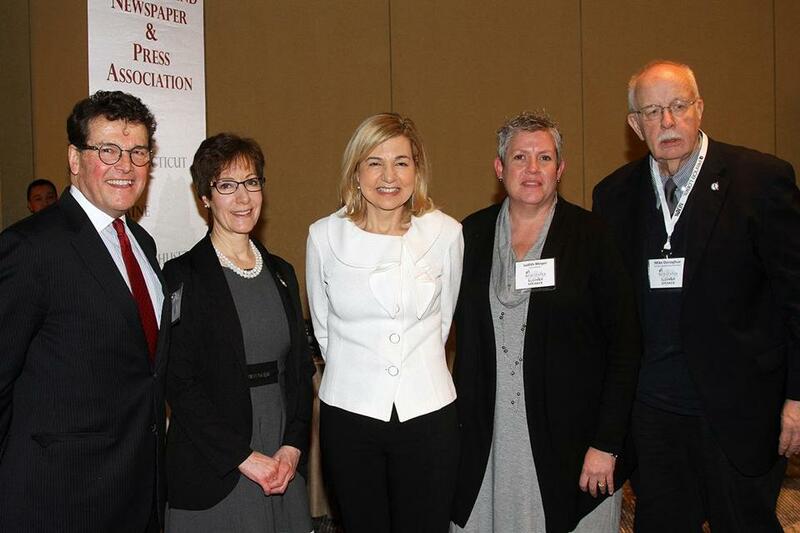 The New England First Amendment Coalition presented its top honor to Margaret Sullivan, the media columnist for The Washington Post. Sullivan accepted the Stephen Hamblett First Amendment Award on Friday before a large crowd of journalists, lawyers, educators, students, and media executives at NEFAC’s annual awards luncheon at the Marriott Long Wharf. The award is named after the late publisher of the Providence Journal who passed away in 2005, and past recipients have included US Senator Patrick Leahy; former federal judge Nancy Gertner; former Globe editor Marty Baron; James Risen and Anthony Lewis of The New York Times; and GlobalPost founder Philip Balboni. The New England First Amendment Coalition also presented Judith Meyer, executive editor of the Sun Journal of Lewiston, Maine, with the Michael Donoghue Freedom of Information Award, and Donna Green of New Hampshire received the Antonia Orfield Citizenship Award. Among those in attendance at the luncheon were Justin Silverman, executive director of the New England First Amendment Coalition; Dan Kennedy of Northeastern University; Michael Rezendes, Larry Edelman, Emily Procknal, Jasmine Wu, Nick Osborne, and Linda Pizzuti Henry of the Globe; Mike Beaudet of WCVB-TV; Tom Fiedler, dean of the College of Communication at Boston University; and WBZ political analyst Jon Keller, who served as emcee.